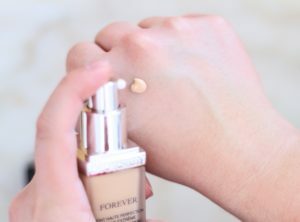 Let’s start by the thing that surprised the most, the fact that this is a full coverage foundation with a velvety finish that manages to illuminate the skin and leave it beautifully flawless. The finish, is really what drew me in, I used to love matte foundations because of my combination skin but I’ve moved away from those and towards more illuminating finish ones. I would say the Diorskin Forever is an illuminating satin, it’s long lasting as a matte one without the drying look and makes my pores disappear! The coverage, is quite high, and if you follow me for a while you might be already aware that I’m not a full coverage foundation kinda person, I like my skin as natural as possible and thankfully don’t have a lot of stuff to cover, regardless, this is easy to wear and leaves my skin even, illuminated and with that “skin perfection” finish. 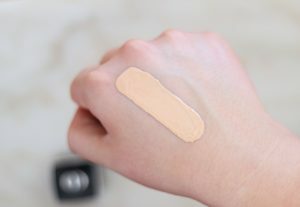 The shade, my shade is 012 Porcelain, which I was really on the fence with when I was colour matched because it leans slightly more on the pink undertone – and I’m really funny with pink undertone foundations, even though I have a neutral skin undertone – but somehow I can make it work as you can see on the swatches. The formula, it leans on the thick side which affects the application slightly. It has SPF 35 which is always a plus if you’re not going to be under flash photography. Also has a very strong floral scent, that disappears quickly after application, just so you are aware. 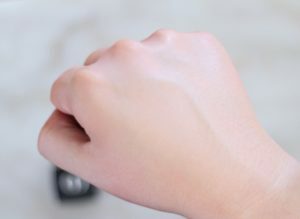 The application, now this is one thing that I have to say something not so good about, I do find it glides easily on the skin and the application is easy, however, not as easy of most of my other foundations and that’s why I need to mention it. It doesn’t blend in one swipe and I need to spend a bit more time blending but I guess compared to other full coverage foundations on the market it’s probably one of the easiest ones. The wear, this wears really well and even though is full coverage and not lightweight doesn’t feel heavy on the skin and lasts all day. On the shine department can’t say much about because I don’t have oily skin, but on my combination nose the shine was controlled really well.